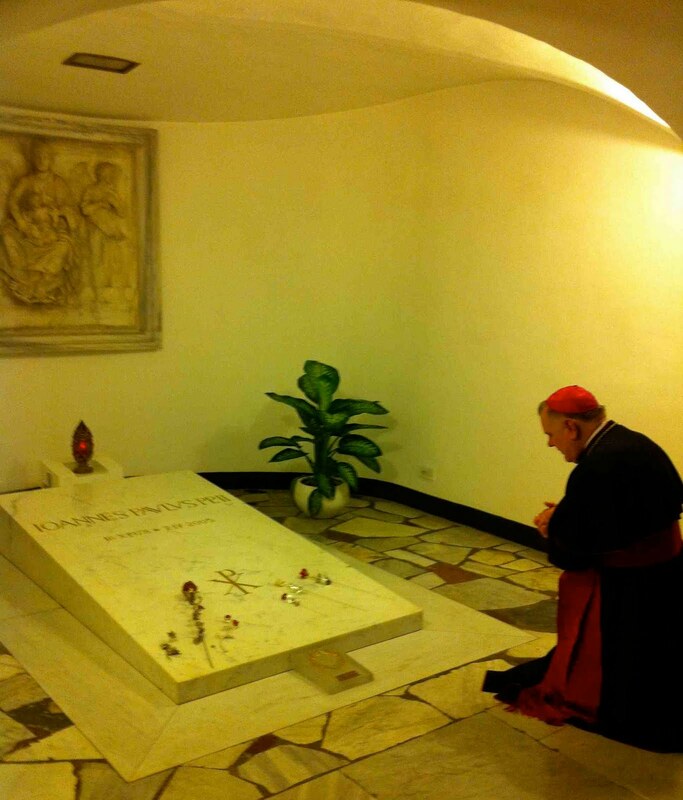 On the eve of his reception of the pallium, South Florida's own Polish "Pope" took a moment to pray at the tomb of his ancestral homeland's most famous product of all, who Tom Wenski once dubbed an exemplar of "extreme holiness." To be sure, the legacy of John Paul II is never far from Miami's first native-son archbishop. One of the two vision-texts of Wenski's episcopate is the late pontiff's Novo Millennio Ineunte ("at the dawn of the [third] millennium"), and just a day after his installation as earlier this month, the figure of Wojtyla loomed large in Wenski's homily at the church's annual Red Mass for lawyers, judges and public officials. Assailing "the folly of Roe v. Wade" and what he termed the establishment of "a new secular religion" from the Supreme Court's rulings on abortion, the Southeast's polyglot Pole held up the example of the late pontiff as one that didn't seek to "impose his beliefs, his morality, nor seeking any special privileges for the Catholic church," but aimed instead for the standard "that the church proposes; she does not impose." Recalling President Barack Obama's meeting last year with Pope Benedict, Diaz said that "while such a brief formal occasion doesn't allow for a deep relationship to develop, it is clear that the pope and the president share key values and philosophies as well as their Christian faith." "Together they seek to make this a better world -- to foster peace, to promote justice and freedom, to feed the hungry, to heal the sick and to bring a message of life and hope to those desperate to hear it, as well as those who refuse to hear it," the ambassador said. Diaz said the United States appreciates the immense value of faith-based organizations and their ability to "translate compassionate intent into practice," both domestically and in the international arena. Archbishop Wenski said the Miami Archdiocese has a special vocation to welcome immigrants, especially from the Caribbean and Latin America. In that sense, he said, Miami has become "America's modern Ellis Island." "The church in Miami and South Florida was always there for the newcomers. It was there for the Cubans right after the revolution in 1959 in Cuba. And it has been there now for the Haitians who have fled the earthquake and have come to South Florida for medical treatment. So Miami represents hope for so many people," he said. The archbishop recalled Pope Benedict's praise of the healthy church-state relationship during his visit to the United States in 2008. But the pope also challenged the United States, he said, warning about a modern secularist trend toward "living as if God did not matter." "As Catholics and Christians, our witness is to show to the world by the way we live how joyful life can be when we live convinced that God indeed does matter," he said.